Home Technology - Hacking How to Create a Bookmarking App Like Instapaper? How to Create a Bookmarking App Like Instapaper? Reading your favorite story is fun and even more, when you can enjoy it with your favorite reading app that allows you to save and share your articles to read it in your free time. When we look into the insights, it says, “reading apps have been continually growing and improving with the constant latest updates and features since their emergence”. Approximately 10 years ago, Amazon released its first Kindle app. And, it has become one of the top reading apps around the world. Alike Amazon Kindle, there are many other types of reading apps such as Adobe Acrobat Reader, Audible, Audiobooks, Nook, and Instapaper, which readers would like to have in their devices in order to explore the latest books on a daily basis. In a marathon among the best reading apps, Instapaper has already set its benchmark that is the best bookmarking app, allowing people to browse latest and interesting articles. People can like those articles or save them for reading in their free time. In short, it lets readers browse articles and videos from top sites so that they can them later. Talking more about Instapaper, this bookmarking application comes up with several reasons to like it. One of the top features is that it lets you save and read the web pages in offline mode. Moreover, the readers have found-out Instapaper usable than others because of its re-formatted text, plus easy-to-read layout. It provides a better experience of reading as compared to other reading apps, which are currently available in both Apple App Store and Google Play Store. Whether you would pick Android or iPhone app development company for developing your own bookmarking app like Instapaper, herein, you need to take notice of the top features before diving into the concept. One of the most important features, which makes Instapaper a highly preferable bookmarking app is that readers can use it even when they are offline, and they can access the latest updates as well as videos. As we compare to other bookmarking applications, a maximum number of apps are still not free. They start asking for a subscription if readers want to access additional features within the app itself. But now, things have changed. Readers can get easy access to everything in terms of latest news and videos within the app. Likewise, you can also allow your users to browse contents and articles offline. You can ensure that you include an offline viewing feature in your bookmarking app. While creating an app like Instapaper, this is a must-have feature to consider. This feature allows readers to save their favorite sites for reading later with just one click. The best thing about Instapaper is that you can consider while creating your own reading app is this app does not distract readers, no matter if they are online or offline mode. You may know that Instapaper app has always been free. But you may not be aware of the fact that the premium features provided by this bookmarking app are free, too. This is one of the best features that you need to consider for your application like Instapaper. When it comes to premium features, users are generally restricted to use only a few features, but not all. This feature makes Instapaper worthy. In order to grab more and more readers, you are open to adding this ‘premium feature’ that can surely make a difference. Instead of searching abstracts, the ‘full-text search’ is more effective. Here we’ll talk about the essential feature of Instapaper. The feature reflects that if readers could not find out the name of the specific article like what they want to read again, then they can browse through by using full-text feature. In order to find out the names, topics, publications or anything else, readers need to dig out of the saved articles. You can also make sure that your future bookmarking application would not miss out the feature, which is highly effective, and can make your app stand out. The feature ‘unlimited speed reading’ is meant to help readers to eliminate ‘subvocalization’. The term ‘subvocalization’ means that the voice in the back of readers’ minds while reading. And, it reduces time lost scanning among the words, and resulting, readers will end up with more focused and fastest reading experience. The unlimited speed reading is a must-have feature as your app could not complete without including this unique feature. By picking the idea of notes by Instapaper, you can make your bookmarking application stands out. 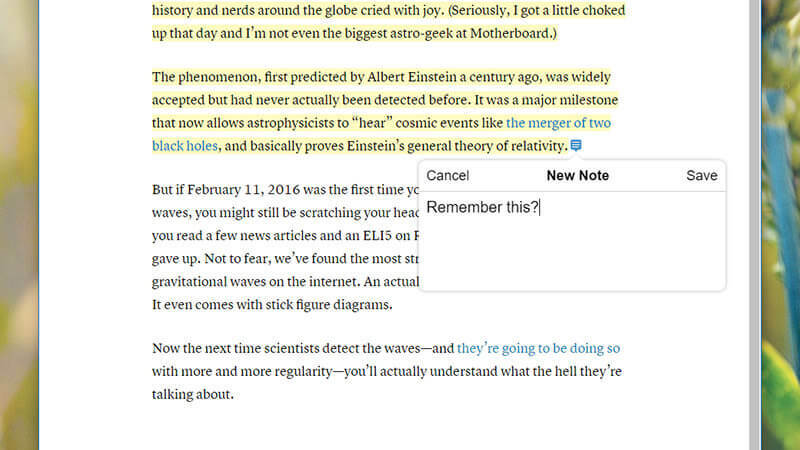 In Instapaper, notes can be added by just highlighting a block of text on Instapaper articles. This feature can also be helpful for your readers if you would also consider it. Opting for a bookmarking app like Instapaper is something that readers have always wanted to because of its amazing features. However, you can also pick features as what you believe could make a difference in order to create one of the best bookmarking apps. So, if you want to share your thoughts or have any query related to bookmarking app development like Instapaper, you can get in touch with us via below given form. Our representatives will revert you soon with the best possible solution.